Don Brutzman is a computer scientist and Associate Professor working in the Modeling Virtual Environments & Simulation (MOVES) Institute at the Naval Postgraduate School in Monterey California USA. He is one of the original participants involved with Virtual Reality Modeling Language (VRML) since this community effort began in 1994. He is a founding member of the non-profit Web3D Consortium, serving on the Board of Directors. He cochairs the X3D Working Group and leads X3D technical development efforts. He also serves as the Web3D liaison to the World Wide Web Consortium (W3C) Advisory Committee. 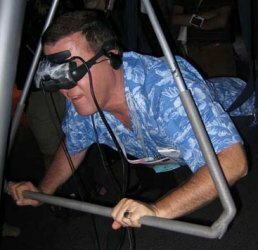 He has been teaching VRML and X3D since 1996. His research interests include underwater robotics, real-time 3D computer graphics, artificial intelligence and high-performance networking. He is a member of the Institute of Electrical and Electronic Engineers (IEEE), the Association for Computing Machinery (ACM) Special Interest Group on Graphics (SIGGRAPH) and the American Association for Artificial Intelligence (AAAI). Dr. Brutzman directs numerous research and development projects as part of the Extensible Modeling and Simulation Framework (XMSF).